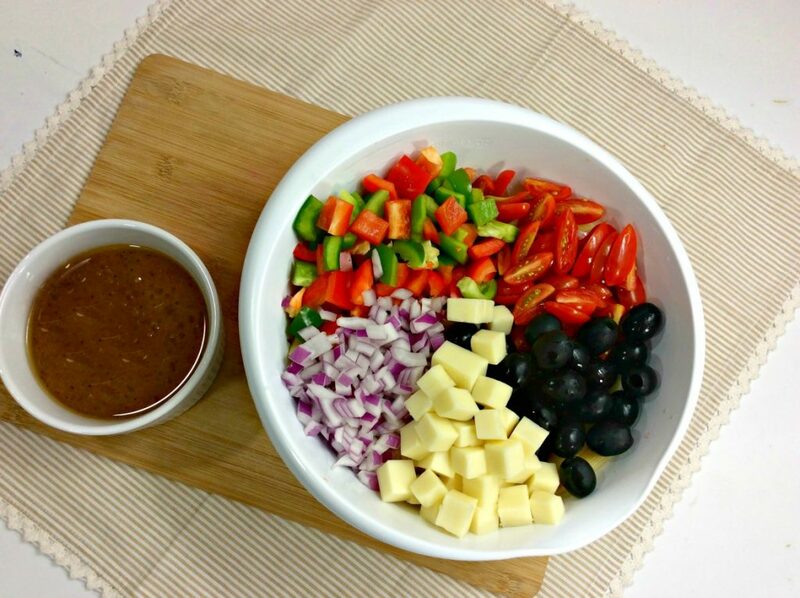 Combine these fresh ingredients for pizza salad and get your pizza fix the healthy way! And what makes this recipe even better? It’s a healthier version, even fitting into the Weight Watchers points program, coming in at 3 SmartPoints per serving! When you use fresh vegetables in this pizza salad recipe, the entire salad is elevated. All of a sudden it tastes like summer! The pepperonis remind me of pizza, so it’s easy to get my fix with this better-for-me salad. 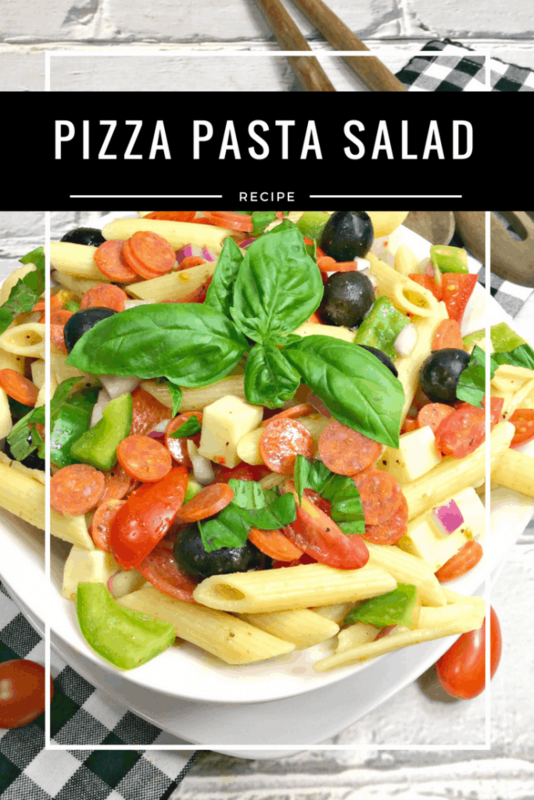 Every time I take this pizza salad with pasta to cookouts or get-togethers, everyone asks me for the recipe. 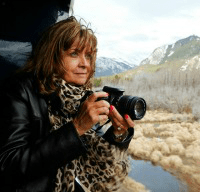 The funny thing is – it’s SO easy to make! After you put it together once, you’ll have the recipe memorized. When you’re buying salad dressing at the store, make sure you get one that’s low in sugar. It’s easy to control the amount of sugar in your dressing if you make your own. Making Italian salad dressing is super simple. I love using olive oil with red wine or flavored vinegar. When I was in Victoria, BC a couple of months ago I tasted a fig balsamic vinegar that was out of this world and would be perfect with this salad. Use salt and pepper to taste. You can also add in garlic powder for an extra kick! One of my biggest complaints about making salads is how time-consuming it can be. This is why I like having a “prep day.” I chop up all my fresh veggies and store them in plastic containers in the fridge. I also make sure I have a jar of homemade dressing premade. 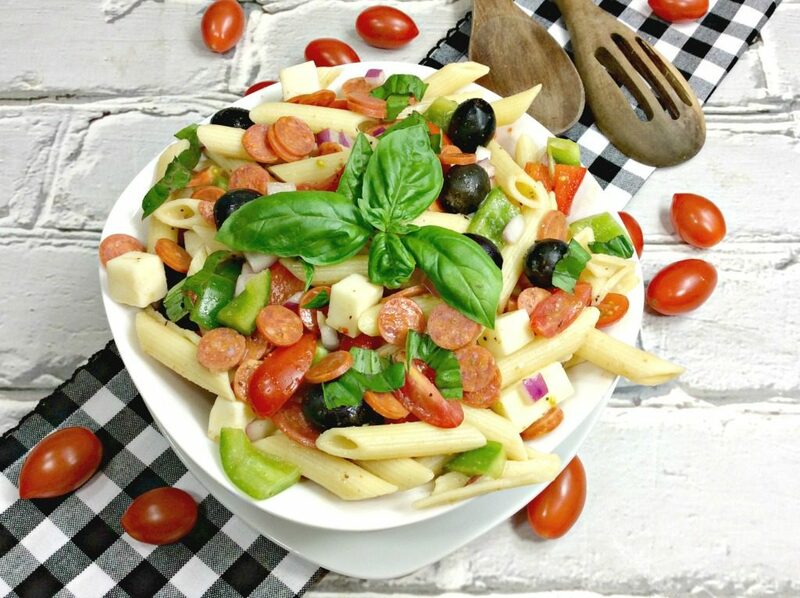 When it is time to make this pizza salad, I just have to boil the pasta and mix in the veggies and dressing. This saves me so much time! You could even add all the ingredients except the pasta right in a mason jar. Have you seen my salad in a jar recipes? They make life so much easier to take lunch with you to work. On busy weekday mornings, you just have to grab the jar and go. No excuses for eating out! Make sure your fridge is stocked with the following foods so you can make your own Pizza Salad. That’s it! You can always add in your favorite veggies and switch up the type of pasta, too. Broccoli and cauliflower taste amazing with the onion and pepperoni. 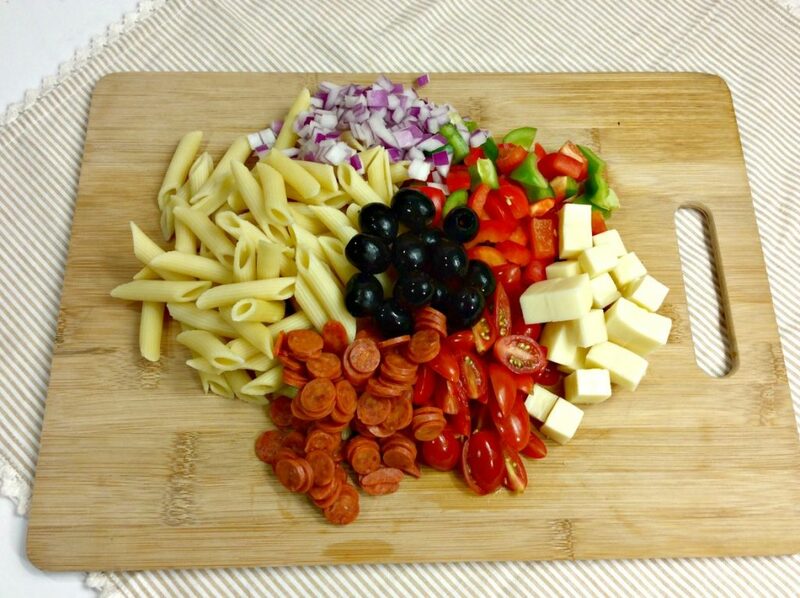 Here is everything you need to know to make your own pizza salad with pasta. It’s such an easy-breezy recipe! Set to the side to chill. Prepare your vegetables and proportion the rest of the ingredients. 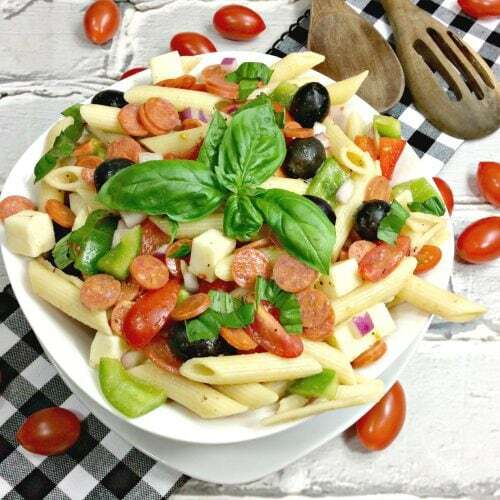 In a large bowl add your pasta, red & green pepper, tomatoes, cheese, red onion, olives, and pepperoni. 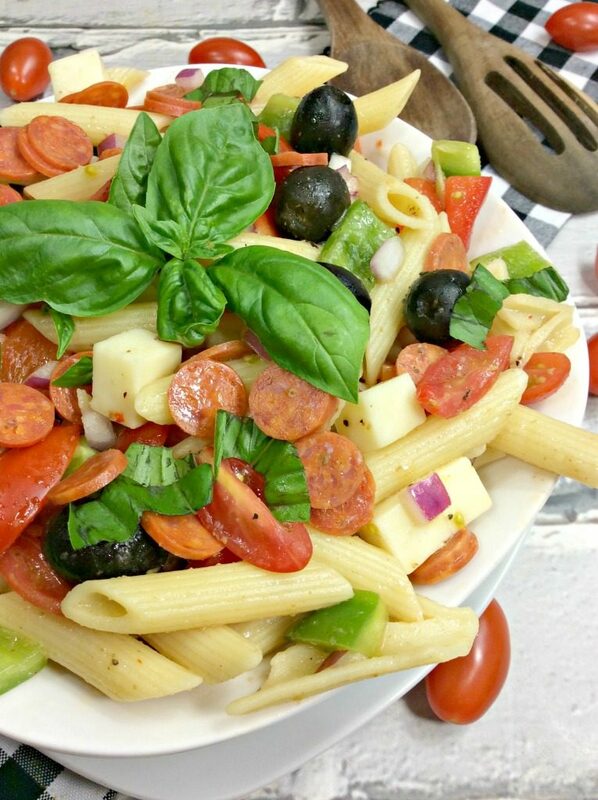 How Many Servings Does This Pasta Salad Make? If you follow the directions as written, this makes 7 servings. This is perfect for a week’s worth of healthy lunches. 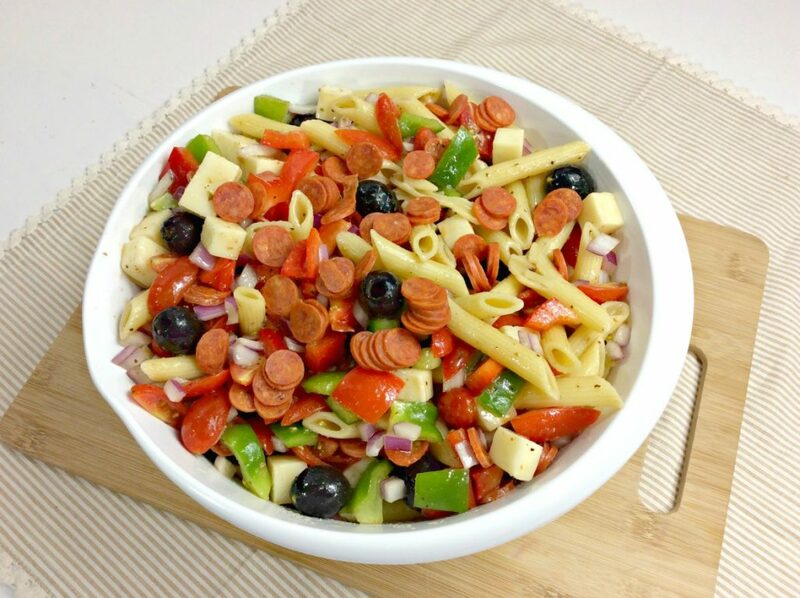 If you enjoyed this Weight Watchers Pasta Salad recipe, you’ll want to check out my other Weight Watchers Recipes! Love this recipe? 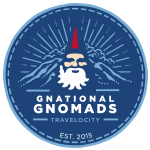 Pin it to Pinterest so others can see it, too. Thanks for sharing! 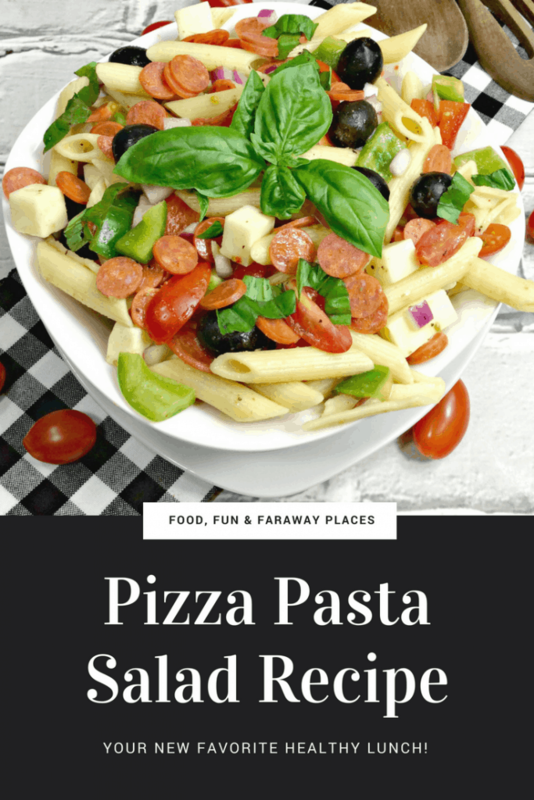 This pizza salad recipe has a lot of herbs and fresh fruits that are very eye-catching and colorful, I love this dish.